Tests live under many names. And, many tests masquerade as unit tests. There are existing practices that I consider to be good guidelines concerning unit testing. William Caputo - Do Not Cross Boundaries. The central idea is to decouple the code from the resources. An added benefit is the reduced running time of the tests. The faster the tests are, the more often they are run. Dave Astels - One Assertion Per Test. While the idea is controversial it's also very thought provoking. If you follow this rule your tests become simple, expressive, and elegant. I don't follow this rule 100% of the time; however, I do believe it's a great guideline. I follow another guideline that I haven't seen documented anywhere. Only one concrete class (with behavior) should be used per test. The central reason for testing concrete classes individually is to promote durable tests. When several concrete classes are used in one test the test becomes brittle. Making a change to any of the coupled concrete classes can cause cascading test failures. Both mocks and stubs can be used in place of concrete classes where necessary while testing an individual class. If you find your hierarchy too complicated to use mocks or stubs this is probably a sign that you need a simpler and less coupled hierarchy. Using Object Mother is a common alternative to refactoring to a better hierarchy. If you find yourself reaching for Object Mother, take the time to refactor instead. A basic build generally consists of clean, compile, and test. However, you can (and should) add more or tweak the build to make life easier and increase the quality of the code you produce. Most people _hate_ working on the build. Build languages are usually painful to work with and optimizing the build isn't very exciting. However, you should be running the build several times a day so each optimization can save you a lot of time over the life of the project. Separate Tests - Create unit tests that test specific responsibilities of individual classes. Create functional tests that test classes working together to achieve a larger goal. Database Generation - Use database scripts to generate the database during the build. Optimize the process by only dropping and adding tables, views, etc when the script(s) change. However, clear and reload the sample data on each build to ensure functional tests are hitting consistent data each build. Simian - Use Simian to ensure that duplicate code is not slipping into your code base. Code Coverage - I admit it, Code Coverage can be misleading. However, managers and business sponsors love charts with reassuring numbers. Additionally, if the team pays little attention to the code coverage number an interesting thing happens. No one attempts to trick the code coverage numbers and they become useful. When the numbers dip below tolerance the tech lead can use the warning to suggest to the team that more focus be given to testing. Note: The tech lead should never mention that the code coverage tool tipped him off or the team may start writing worthless tests that satisfy the code coverage tool, thus rendering it useless. Modification Compilation - Use a build language that can detect modification dates. Components of your application only need to be recompiled when changes are made to the source files. There are other tools such as CheckStyle and FXCop that are supposed to be helpful. In theory they sound great; however, I've never used either so I didn't include either. Please let me know if you have any suggestions or optimizations I've missed. I recently blogged about Rich Client Development in a 4 part series that led to a small reference implementation. It is immature, but it's in perfect condition to demonstrate the value of PicoContainer. This implementation is shorter and arguably easier to understand. Notice PicoContainer creates instance of the dependent objects I need including an array of IPresenters that are used as a constructor argument to the PresenterFactory. If you design your class as Good Citizens and prefer Constructor Injection, adding PicoContainer should be easy and very worthwhile. I recently received a request to show how Model View Presenter and a modal dialog could work together. I'm going to use the existing rich* client example I've been working with lately. For demonstration purposes we will assume that the UserData class has a password property that contains a user's password. When a user updates their information they will be prompted to enter their password. Successful authentication updates their information and navigates the user to the read only view. Unsuccessful authentication does nothing, but clicking "Cancel" will close the dialog without saving info and without navigating away from the update view. The modification is to add a password to the existing UserData instance. The only change to the UpdateView is to remove the NavigationDispatcher.RaiseNavigate method call from the saveButton click handler. We'll now handle navigation in the presenter (perhaps we should have moved it when we introduced the NavigationDispatcher anyway). The SaveUserDialog is a Windows Form that allows a user to enter a password and save, or cancel and do not save. SaveUserDialog exposes it's PasswordTextBox as a public field. When a user clicks the "Save" button SaveUserDialog raises the RequestAuthorization event. Clicking "Cancel" just closes the form. The presenter for the SaveUserDialog has the responsibility of verifying the password matches and then setting the dialog.DialogResult = DialogResult.Yes. I considered passing the entire UserData object to the SaveUserPresenter; however, it seemed easier to keep this presenter as thin as possible and keep the save functionality in the UpdatePresenter. If more functionality were required I wouldn't hesitate to pass in more objects and give more responsibility to the SaveUserPresenter. All of these changes and additions come together in the UpdatePresenter. The UpdatePresenter is now responsible for creating and showing the SaveUserDialog. Additionally, the UserData instance should only be updated if the SaveUserDialog returns DialogResult.Yes. Lastly, the UpdatePresenter is also responsible for calling NavigationDispatcher.RaiseNavigate if DialogResult.Yes is set. If my application contained several modal dialogs I would also look at possibly moving the creation into a factory similar to the PresenterFactory. Each presenter could take the DialogFactory as a constructor argument allowing for easy access. For testing purposes I would create a IDialog interface that contained the DialogResult property. Each Dialog would obviously implement the IDialog interface and the dialog presenters would take an IDialog as a constructor argument instead of the concrete class. This would allow me to easily mock the dialog when testing the SaveUserPresenter. 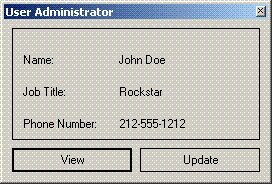 In Part III I completed the UpdatePresenter and had a working demo application. Unfortunately, you may have noticed that in MainPresenter the Navigate of each view is subscribed to each time it is returned from the PresenterFactory. This causes the MainPresenter to reload the View as many times as it has been returned from the PresenterFactory. To solve this issue you can add another class called NavigationDispatcher. The only other change to make is in MainPresenter. Subscription to the NavigationDispatcher's Navigate event occurs in the constructor; however, the subscription is no longer necessary in the Navigate event (where we used to subscribe to the Navigate event of the View). Obviously, the Navigate event can be removed from the IView at this point also. Adding the UpdatePresenter actually led to a decent refactoring. After adding UpdatePresenter I realized that I needed the ability to push changes in the UserData instance to the ReadView. This meant changing the ViewFactory to a PresenterFactory. This change was required because the Presenter handles pushing changes to the view. Therefore, I needed to maintain a reference to the presenter and call Push before displaying a view. The refactored ViewFactory becomes this PresenterFactory. This lead to changing the EntryPoint to add IPresenters to the PresenterFactory. The IPresenter interface is used to get access to the View and to Push the model changes to the View before it is displayed. After these changes you can add the UpdatePresenter. In Part I I described the basic set up for creating a smart client application. 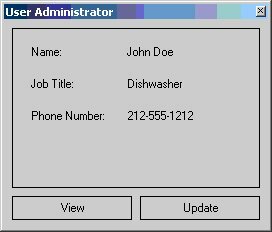 The next step is to add some data to the UserData object created in the EntryPoint and then display this data in the ReadView User Control. EntryPoint should be updated by adding some values to UserData and passing the user object to ReadView's presenter. ReadView's presenter handles the logic that puts the correct data in the ReadView. The only other changes that need to be made are making the NameLabel, JobLabel, and PhoneLabel public on the view. The result is a dumb view and all the behavior is in the Presenter. The view should look similar to this and be working at this point if you click on "View." 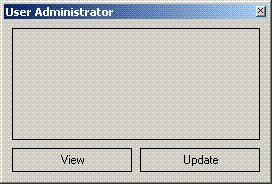 In Part III I'll create the presenter for the UpdateView. A friend recently requested that I document how I've recently been doing smart client development. I decided to put together a small application to show the basics. The first step to creating a smart client application is setting up the solution. The UI will need to be separated into a Class Library project and a Windows Applicaiton project. The Windows Application project will usually contain only the entry point to the application. All other UI components will live in the Class Library. Testability is the reason we separate the UI components into their own library. It's possible to be tricky and combine the projects; however, separating this way is easy and allows us to test the UI components without any additional steps. in response to user actions. Next we'll add the views and handle navigating between them. For now I'll use view place holders that have a label that says "Read" or "Update" depending on which view is being displayed. The ReadView also navigates to the UpdateView when the label is clicked. This allows us to verify that the navigation is wired and working. The User Controls are normal User Controls that implement the IView interface allowing them to be used for navigation. The IView interface only contains the Navigate event used for specifying which User Control to navigate to. The NavigationHandler specifies a parameter of Type allowing you to specify which view to navigate to. The ViewFactory holds each View in a Hashtable and returns them based on the type requested. The MainForm also implements IView. Implementing IView allows MainForm to raise Navigation events. The user triggers this navigate by clicking one of the buttons. The button click event then raises Navigate with the appropriate view specified. The MainFormPresenter ties everything together by subscribing to the Navigate events of both the MainForm and each View. When the Navigate event is raised the Presenter requests a view from the ViewFactory. This example is simple, but will be the basis for showing how to implement a easily testable and well separated UI layer. When developing using BDUF log files are often used to determine expected input and output. The log file is a valuable tool that can be used to determine the source of bugs and problems. However, once you step into the world of Test Driven Development you should leave the log file in the past. Instead of depending on a log file, the test suite should test for boundry cases that would appear in a log file. BDUF is walking (or crawling), but Agile development is running. When you want to run, leave the crutch behind. Attributes in .net are controversial. NUnit's attribute usage has been praised. Conversely, the NanoContainer implementation has been criticized*. So what is the difference? What makes one usage successful and another a failure? In an email exchange, Martin Fowler expressed to me (roughly, I didn't save the email, so I can't quote) that a major problem with using attributes is that they can cause coupling issues. For example, adding the NanoContainer attribute will add a dependency to NanoContainer within your project. Compared this to the NUnit implementation, NanoContainer is much more intrusive. The NUnit attributes are used on the test classes (and test methods). This requires no change to your existing classes and adds no dependency on NUnit within your existing classes. 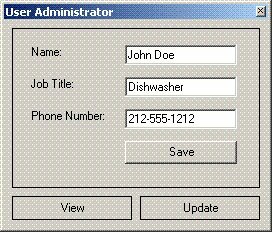 Attributes are often used as class markers, which can also be done by implementing an interface. However, if you need to mark a method or property an attribute is a great candidate. I think this is another reason that NUnit was so successful concerning attributes. Conceptually, without attributes a class could implement a ITest, but which methods would be run as test methods? So, when would you use attributes in your code? Currently, I'm working on a project where we have an object that represents several database tables. Additionally, these tables contain data that needs to be transformed. The transformation rules are contained in a database that the business analysts maintain. The business analysts are intimately familiar with the database tables and columns. Therefore, the transformation rules are written using the database table and column names as identifiers. Unfortunately, the table.column identifier is not very descriptive. For readability we chose to create readable properties on the object and simply add a attribute that contains the table.column identifier. The transformation engine can load the rules from the database, use reflection to find the corresponding property, and transform the value. With this implementation, the value of the property can be easily accessed using reflection and the identifier or simply by accessing foo.Bar. Conceptually, this could be done with some mapping code also, but this seemed to be the simplest thing that could possibly work. * Personally, I like the attribute usage in NanoContainer also.